Drawing millions of visitors every year, following in the footsteps of the Celts and Romans who prized Bath ('Aquae Sulis') for its hot springs and the later Georgians who transformed the city into it's current classical glory of impressive streets, squares and crescents that are built with classical facades rich with warm golden stone glow, Bath became a World Heritage Site in 1987 and is one of the UK's top tourist destinations. 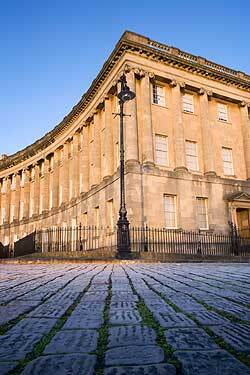 Must do attractions to see in the city itself are the Roman Baths, take tea in the 'Pump Room' restaurant, walk through the streets to the Royal Crescent and follow Jane Austen's Bath trail before grabbing a snack of Sally Lunn's famous Bath bun! Once you've enjoyed all the city has to offer (we strongly recommend the excellent - and free! - Mayor of Bath's guided walking tours), hop on the train to Bristol or travel with Celtic Horizons to explore the Cotwolds, South Wales or Glastonbury. Bath can be visited either on one of Celtic Horizon's suggested tour routes or build it in to a custom tour around your own requirements - contact us for details and prices.